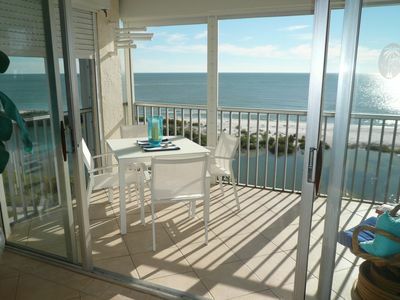 Amazing Gulf Access - Foosball - Heated Pool - Room for the Whole Family! 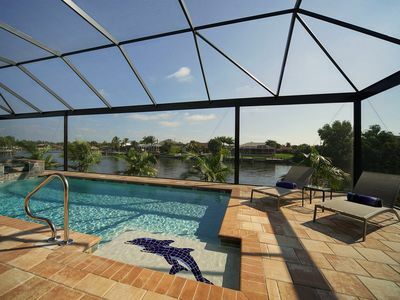 Just under 4000 Sq Ft home with a sun-drenched southern exposure pool and direct 2-minute sailboat access to the river. 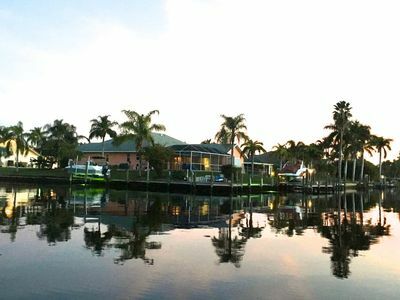 Located on the 200 foot wide Odyssey Canal in SE Cape Coral. 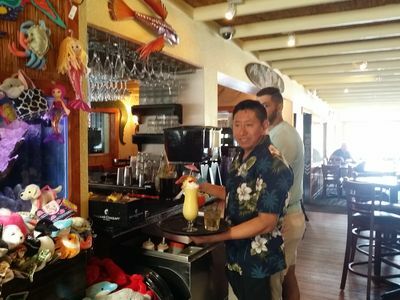 Villa Geanie has it all! 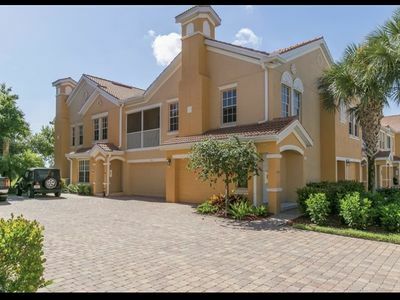 This large home will sleep 8 in 3 bedrooms. 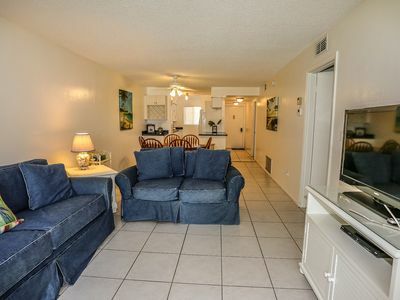 The home completely renovated for Vacation Rental guests and the living space in this home will never be an issue. 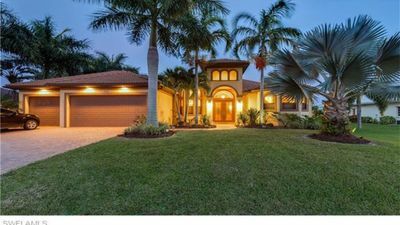 The home constructed with a formal living area and a family room. The family room has a flat screen TV above the stone fireplace and sliders with direct lanai access. This family room has plenty of seating for your group to enjoy and relax together. In the formal living area, there is seating for 6 people and direct access to the pool area. Wifi and high-speed internet. Cable TV available. The fully-equipped kitchen has plenty of cupboard space and a full appliance package. In the kitchen is a workspace island that is set on casters. In the expansive formal dining area, the home has seating for 8. The gigantic master suite has a four-poster king-size bed, Flat-screen TV, enormous walk-in closet and a master bath that boasts both a walk-in shower, his and her sinks and separate roman tub. The master suite also has a sitting area and direct access to the pool area. One guest bedroom has been designed for a family to use or for several children from two families traveling together. This large space has 2 queen-size beds, a sitting area and plenty of room for a group to co-habitat. Children traveling together will have plenty of space to play. The room is equipped with a flat-screen TV. The other guest room has a four-poster full-size bed, a twin size bed, and a flat-screen TV. The full-size guest bath is accessible from both guest bedroom areas. The bath equipped with dual sinks. 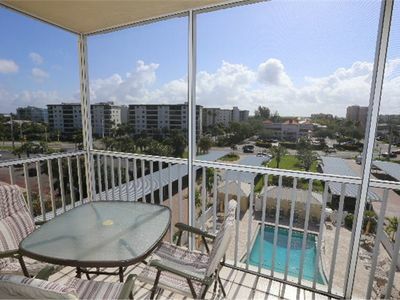 The pool and lanai area with its south facing exposure will offer all day fun in the sun. 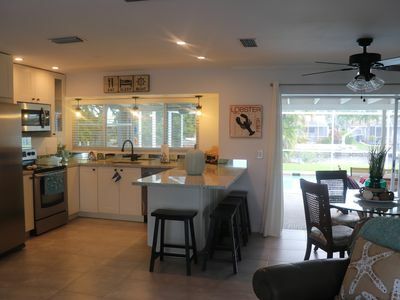 The expansive lanai with pool loungers, outdoor dining, and seating for 8. There is a dedicated pool bath in the area. 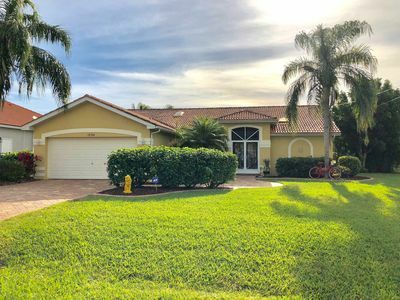 Great for spending the day around the pool or when you are entertaining friends and family with the al fresco dining, swimming in the pool or cooking on the gas BBQ grill. 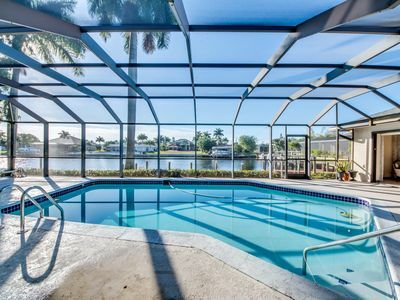 The heated pool overlooking the wide canal is Florida living at it's best. The enormous dock has plenty of room for your vessel. Boat lift use needs to be pre-approved by the Management Company. Not sure where to rent a boat, ask us we can recommend! Pets are prohibited on the property unless authorized by the Property Manager. If unauthorized pets are found on the premises the guest will be charged a non-refundable Pet fee of $150 per pet and is subject to possible eviction. Pets must be under the owner's control at all times. Cleaning and disposing of pet excrement is the guest's responsibility. The Pet Fee is per pet and must be paid in order for the animal to stay in the home. 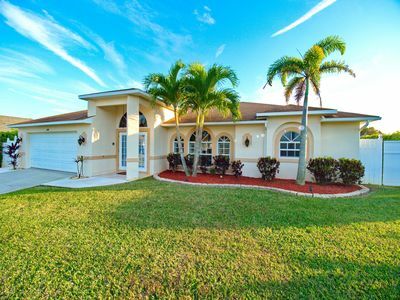 Villa Geanie has great access to Fort Myers, the airport and all points in Cape Coral. 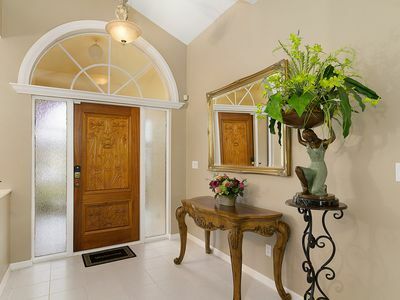 Yes, you can have it all while staying in this luxurious home. Golf, boat, beach, fish and explore nearby islands. 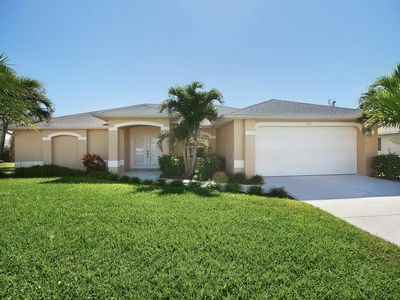 Catch tarpon from your backyard, pick fresh fruit and this great southeast location is close to shopping, dining, entertainment, and bridges to Fort Myers. 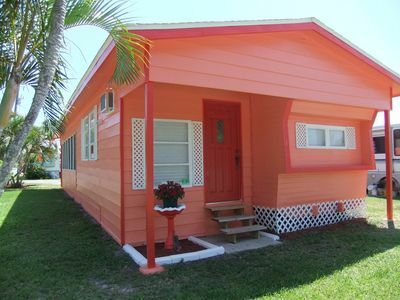 Please note: Electricity is charged separately for this home at the rate of $12 per day. This fee is collected at the time of final payment and is considered prepaid utility use. This prepayment has been included in your quote and is part of the total reservation cost. Post-departure paid utility use may be offered at booking and will be billed at .185 kW for actual daily usage plus 11.5% tax and will be charged to a credit card on file. Pack & Plays (Portable Crib) and Highchairs are available with a small rental fee. 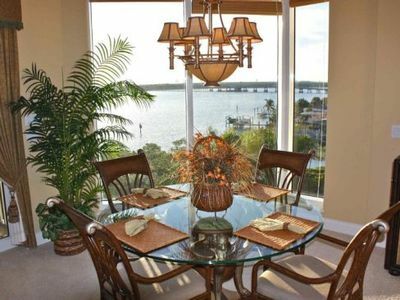 A Perfect Place To Throw Your Anchor, Secluded, Gulf-Access Condo. You will love the location of the complex. 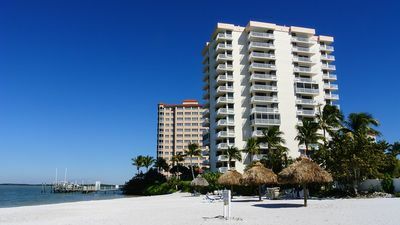 Sand Caper 509 is on the south end of Ft. Myers Beach. 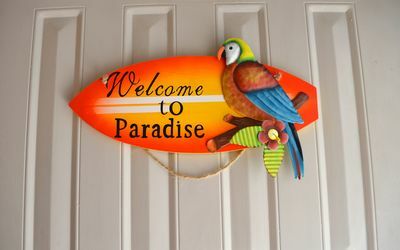 Welcome in the 'Lazy Pelican'! 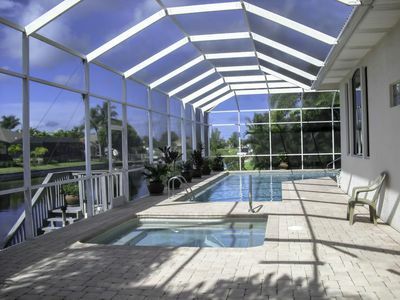 Heated pool, free WiFi, Gulf access! 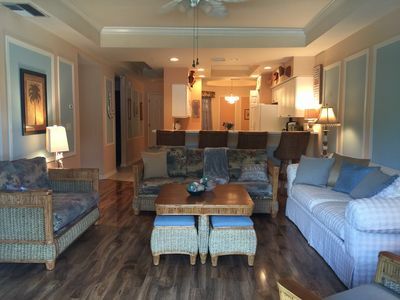 Southern Exposure, Gulf Access, Heated Pool Home with a Hot Tub and Large Lanai!